For some reason I was thinking that Mocha turned 17 today. No, it was last Saturday. Still, she’s doing quite well with herself and is the picture of a content horse living outside 24/7 in a herd. Three years ago, I wasn’t sure she was going to make it this far. The white line disease had affected her mentally, and she really didn’t start bouncing back from that until the fall of 2015, when we finally figured out what was wrong with her feet (mild long-term rotation which meant that the way she had been shod and trimmed up to that point had contributed to a quarter inch erosion of the tip of the coffin bone in both her forefeet). Even with that, she was still hurting and not completely over it until late last fall. Some of that had to do with moving her toe back and raising her heel a little, which is resulting in her feet getting a little bit bigger so that she will soon be a genuine 0 front shoe instead of a 00 in a 0 shoe in order to give her support. 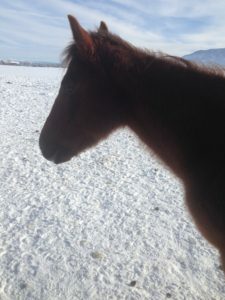 Another factor had to do with something fusing in her rear end besides her hocks–SI joint, stifles, something–so that she naturally stands upright in her hind end and doesn’t walk by placing one hind foot in front of the other (ropewalking). I had noticed late last fall that she wasn’t ropewalking any more. Then we had two and a half months of cold and snowy weather. When the weather cleared, I noticed that she was moving better, lining out bigger and faster in a bold, strong walk, and while she wasn’t spinning like she did as a young horse, neither was she resisting it like she had been for a while. More than that, she grew a thick hair coat this winter and is shedding it out. What little I can see of the spring coat underneath has me hoping that she’s going to be sleek and shiny this year. She’s also had almost two years of some of the best grass and hay in the region, and it shows. I also upped her grain ration (mostly forage-based with alfalfa, beet pulp, and hay fiber) to 3 pounds from 1 1/2 pounds. She’s filled out and calmed down quite a bit, while still having a bit of spark and sting about her. That said, I have to feed the grain before and after a ride in 1 1/2 pound increments because she stops wanting to eat it after 1 1/2 lbs. But she’s doing well on only grain while being ridden. She’s getting to the point where crossing the ditch is no big deal. I point her at it, she negotiates her way down, then leaps up the bank on the other side. Meanwhile, we’ve been having nice riding sessions in the big pasture with long straight lopes and trots. Today I asked for flying changes on the straightaway and there was no fuss or bother about it. We’re coming to an end for the pasture season, though. Soon it will become a grain field and we’ll be back to arena and road riding until October. This summer, we’re planning to take her out hiking with us–husband wants to walk while I ride, probably us riding ahead for fifteen minutes, then riding back. Guess I’d better put the strings back on her Western saddle so we can tie things to it. Right now, though, I’ve been riding her in English tack. For the first time in ages, the saddle seems to fit her and it’s nice for this stage of her conditioning. It’s time to move toward reestablishing her proper muscling. Not that I plan to get too crazy about it–at age 17, especially after she had some rough times, she’s mostly a hacking horse. But that doesn’t mean we might not decide to hit a show or two, either…. I’m hoping to get another seven years or so out of her as a saddle horse. It seems like changing her life from stall horse to pasture horse has given her a new lease on life. At least this spring, it’s been awfully sweet to have my good little saddle mare back, feeling her energy and forwardness underneath me. I’m also daydreaming about the possibility of riding her from the barn to town, hanging out around the house for a couple of hours, then riding her back. We’ll have to see if that works. It is a fun idea, anyway….